If you have been told that the Zone Diet plan requires too much protein, consider this about protein intake: the Zone Diet recommends each meal be 30 percent protein. That isn't an extreme amount of protein, as many people falsely believe about this, as well as other low carbohydrate diets. In fact, if you divide your dinner plate into thirds and fill one third with your chosen protein and the rest is filled with a healthy salad or other vegetables, you'll see that this can be a healthy, balance way to eat. Protein is necessary for the body to function; in fact 16 percent of your body is made up of proteins. If your body does not continually get more protein to support bodily functions, it will get what it needs by breaking down muscle. Protein is made of amino acids. Many amino acids can be made by your own body, but the nine that cannot be made must be consumed in the foods that you eat. Animal products contain complete forms of these proteins. However, high protein foods do not have to be from animal products to give you the protein that you need, they can also be from non-animal sources. Tofu, for example, actually contains 10 grams of protein in only one cup. By eating a well balanced diet of lean sources of protein, low glycemic vegetables and fruits, and healthy fats like olive oil, you can greatly improve your health and maintain the proper weight for your body. A myth about protein intake: the Zone Diet and other "high protein" diets allow you to consume large quantities of any kind of meat that you want. The facts about protein intake: the Zone Diet recommends that you consume moderate amounts of meat along with fruits and vegetables. While there are no forbidden foods in the Zone Diet, there are guidelines that should be followed. Keep in mind that other proteins like muscles, oysters, ham and some lunch meats do have carbohydrates in them and these carbohydrates should be counted when planning a balanced Zone Diet meal. It is also smart to consider that processed meats like hot dogs contain nitrates which are unhealthy. While these foods may be safe in moderation, eating them in large quantities can have a negative effect on your health. Some studies have suggested that higher amounts of protein in your diet can be beneficial to your health. 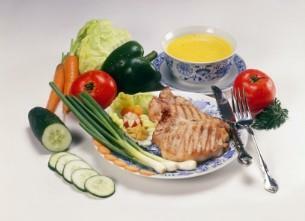 One benefit is that protein may help suppress your appetite so you will feel satisfied even if you consume less food. Another benefit is that protein may increase your metabolism, which helps you to burn more calories. In addition, some findings suggest that higher protein intake may also be helpful in the prevention of osteoporosis, but more research is still needed. If you engage is a strenuous exercise like resistance training, also known as weight training, you can also benefit from eating more protein. Body builders consume a high protein diet to aid in building and repairing muscle, so if you are athletic you may need more than the average person as well. When your body breaks extra protein down into glucose, as opposed to obtaining glucose from carbohydrates, you benefit as well. Glucose from protein is absorbed into your bloodstream much slower than other glucose. Why is this a benefit? Rapidly absorbed glucose makes your blood sugar spike, followed by extreme lows. This is very dangerous and can contribute to diabetes and other health issues. But when glucose is absorbed slowly, your blood sugar levels stay balanced. To determine the minimum amount of protein your body needs, multiply your weight by 0.36. This will give you the approximate minimum amount of grams of protein that you need each day. You can also use the USDA RDI calculator for a more customized result. Divide this by three and you can get an idea of how much you should aim for at each meal. If you eat a little more than the 30 percent that is recommended for the Zone Diet, you shouldn't have a problem as long as you try to stay within your calorie limit. In summary, do not be intimidated by claims that the Zone Diet is too high in protein. As long as you are balanced in your eating plan you will see many benefits to your health. If you are having a difficult time planning your meals in a balanced way, consider looking at a menu for the Zone Diet to get you started. Follow the guidelines for the Zone Diet carefully and always consult your doctor before making major changes in your diet.